Tim Strehle’s Blog » Laurence Hart: What Constitutes Industry Leadership? 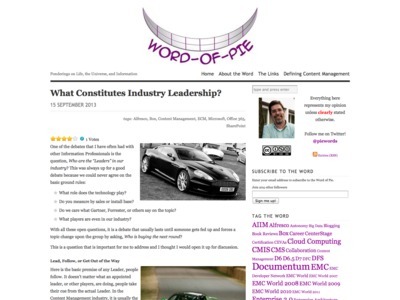 Laurence Hart: What Constitutes Industry Leadership? “People take their cue from the actual Leader. In the Content Management industry, it is usually the vendor(s) that are being copied by other vendors and being brought-up in almost every pre-sales discussion. […] Pretenders: These are vendors that think they are leaders but aren’t perceived that way. The older the vendor, the more likely they are a Pretenders. […] You could have the best tech that money can develop, but if the world either doesn’t know about it or can’t seem to get it to work, it doesn’t matter. […] Leadership is about having the best vision, communicating on that vision, and delivering on that vision.